This recipe is an adaptation of a recipe for a popular dish on the menu of the Antica Bottega del Vino, a storied, well-known restaurant and wine cellar in the northern Italian town of Verona. Amarone della Valpolicella is a prized red wine from the Verona area, made from partially-dried grapes. Its rich, fruity flavor and full-bodied character work well in cooking and it appears in many traditional local dishes, including Risotto all'Amarone, a unique risotto in which the rice is cooked in Amarone wine rather than the usual broth. 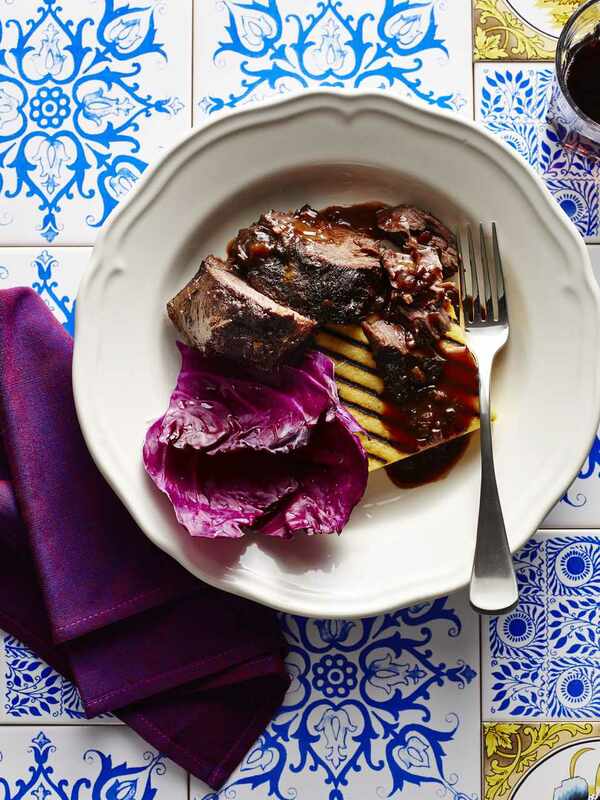 For this dish, beef cheeks are slowly and gently braised in Amarone wine until they're falling-apart tender. This is a decadent, comforting winter dish that would make a great secondo (main course) after a risotto or pasta. It pairs well with polenta or mashed potatoes, but could also be served over buttered egg noodles. Because of the long simmering time (necessary for a fork-tender, melt-in-your-mouth texture), it would make a great weekend project for a Sunday supper. Though the simmer time is several hours-long, the dish itself takes minimum effort and is mostly hands-off. You can use any full-bodied red wine in this dish, but make sure it's of a decent enough quality that you'd be happy to drink it on its own! First, saute your soffritto (the onion, carrot, celery, and garlic) in a large saute pan over medium heat in 1/4 cup olive oil until softened and slightly browned, 8 to 10 minutes. Season the beef cheeks with salt and pepper and add them to the pan. Cook until browned, 2 to 3 minutes. Add the wine and beef stock. Add the spices. Turn heat to low, cover, and simmer gently until the meat is falling-apart tender, 4 to 6 hours. Remove the beef cheeks from the pan and set them aside. Strain the sauce in the pan, retaining the liquid and discarding the solids. Return the sauce to the pan and simmer over low heat until thickened, about 4 to 5 minutes longer. Serve the beef cheeks with creamy polenta, grilled polenta, or mashed potatoes, with the pan sauce spooned over them.